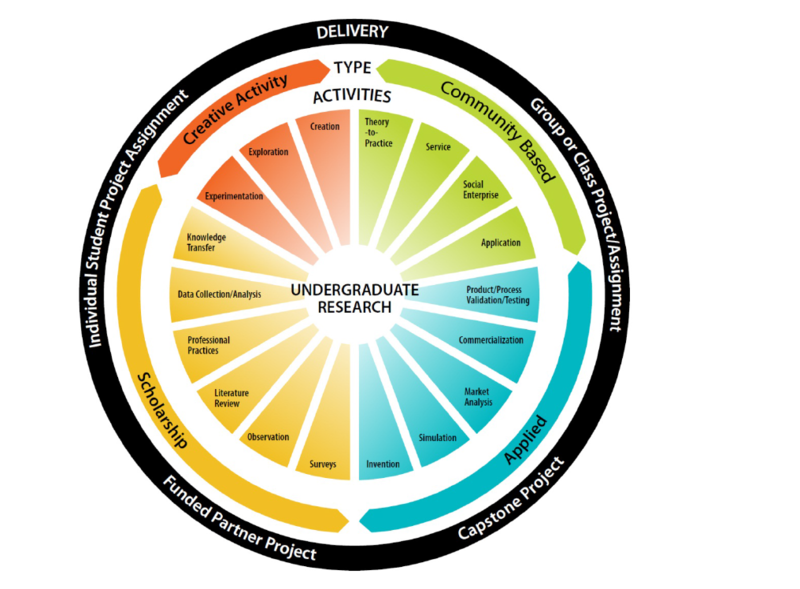 The research wheel is a tool designed to promote research literacy and help faculty, staff and students identify activities that they are already doing or could be doing to enhance the research activities within their programs of study. The core of the wheel is segmented into activities. Each of these activities contributes to a more comprehensive research process. The activities are presented as having an affinity to one of four types of research – creative activity, scholarship, applied or social/public. While there are affinities between activity and research type, it should be recognized that the inner core can spin and activities can occur across affinities. In many situations activities support each other across research types. The outer ring of the wheel provides suggestions for integrating the activities into curriculum. These progress from individual assignments or projects to class or group assignments or projects to capstone projects and funded research projects.